It used to be that when someone worked for a large company not only did they have health insurance, but they also got a decent dental insurance policy where you simply paid a copayment to get work done. Sadly those days are long gone and more & more people in the US are finding that discount dental plans are the way to go. There's no waiting. Sign up online today and go to the dentist today. No age limits & no exclusions. Vision Plan & Discount Rx Plan included for no additional cost. By far the most widely accepted discount dental plan is Careington Dental. Over 10 MILLION members & tens of thousands of providers across the country. How Much Does The Careington Dental Plan Cost? Our individual plan is $9.95 a month Call us directly for your senior discount for two or more members! You must use a dentist or specialist within our provider network. Click here to see how much you can save at the dentist. How does it work? It's really quite simple! Once you join Careington as a member, you are allowed access to our network of dentists who have agreed to provide our members discounts ranging from 20% to 60% on ALL services rendered. The 1st thing you need to do in choosing a discount plan is to be sure there is a provider near you. Literally ALL plans have a dental "network" and you must go to a dentist within their network to get your discounts. 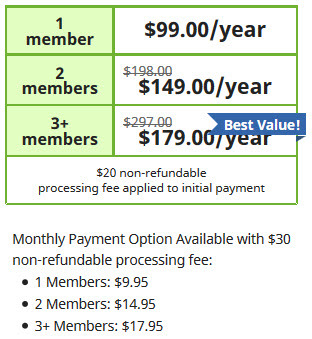 Less Cost To You - Individual plans are $9.95 a month. Includes all Specialists - Endodontics, Oral Surgery, Pedodontics, Periodontics, etc.